I meant to go to the bus station this morning and drive up to Abu Dhabi to see what that town has to offer and to link-up with Richard, an old friend from my Antarctic and Kazakh days. He has been working in AD for 2.5 years and still is with Raytheon. I took a cab from my hotel and meant to go to the station, but the cab driver convinced me that he could drive me to Abu Dhabi for less than the bus ticket. He was right. And, he stuck around AD for the day and drove me back this evening. What a difference a year makes. A year or two ago, cabs were all engaged in Dubai and these other world nationals made about three times what they earn today. Now, any of them is glad to get any business and they are willing to make personal sacrifices in order to earn a living. I paid my driver, Muhammad Nasir, a bonus because he was willing to sacrifice that which I was willing to pay for -- personal convenience. 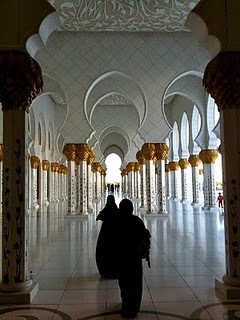 I found that I liked Abu Dhabi very much. While parts of it are too modern with lots of skyscrapers, the city itself was much more laid back, had green parks, a great marina, and even had an IKEA. A view of the marina and some of the skyline. The Marina Mall with an IKEA anchor store. Richard had just arrived a couple of hours ago from Kuwait, a stopover from a month back in the States. Fortunately, he wasn't jet-lagged and was able to pick me up and drive me around. He had to go to the Supermarket for some items. I went with him. An interesting experience. The only market serving pork to non-Muslims is in his neighborhood. Here is the sign posted above a secluded area of the market where they had all kinds of pork products. And the only place to buy marshmallows was in this same area. What's up with that? We next tried to enter the Emirates Palace Hotel. This is a magnificent facility that the UAE claims is seven stars. It probably is, but there is only a five-star rating. It simply means that the UAE is very proud of this hotel, and they ought to be. We drove up the driveway headed to the hotel when we were stopped by security. They wouldn't let us in because we didn't have reservations at the hotel and the hotel was preparing for a large alternative energy conference. So, Richard works his magic and bullshits with the guards. They tell him no reservations, no entry. Richard then tells them that he has reservations. When asked what his reservation number is, he blurts out "7." It didn't work and we were turned away. Next stop was the Sheikh Zayed Bin Sultan Al Nahyan Mosque, this huge and gorgeous mosque that makes all other mosques pale into insignificance. It makes the Taj Mahal look a second-hand effort. This carpet is supposed to be the largest single-piece carpet in the world. Richard wouldn't take no for an answer, so when we completed the tour of the mosque, he called the Sales Manager for the Emirates Palace Hotel, a man he knew from many Raytheon business meetings that Richard had booked at this hotel. This guy made the arrangements and we breezed through the guard post at the hotel. We spend the rest of the afternoon sipping coffee and whiskey while listening so a trio playing some kind of Arab music. It was a fine end to my stay in Abu Dhabi. Richard drove me back to the Marina Mall where Muhammad Nasir was waiting for me to drive me back to Dubai. I really don't want to return to Afghanistan or the Army tent city at Ali Al Salem.